Federal courts are slowly becoming a new battlefield in the war on terror, with combatants setting aside traditional weapons and arming themselves instead with domestic and international laws. Responding to this phenomenon, the inaugural meeting of The Lawfare Project convened last week in New York to discuss The Use of the Law as a Weapon of War. "a cynical manipulation of the rule of law and the humanitarian values it represents. Rather than seeking battlefield victories, per se, challengers try to destroy the will to fight by undermining the public support that is indispensable when democracies like the U.S. conduct military interventions." Dunlap recognized some time ago, as Supreme Court Attorney (France) Francois-Henri Briard said at the conference, "the law may be a weapon, and litigation a battlefield." To thwart free speech on issues of national security and public concern. To delegitimize and diminish the sovereignty of democratic states. To inhibit the right and ability of democracies to defend themselves against terrorism. 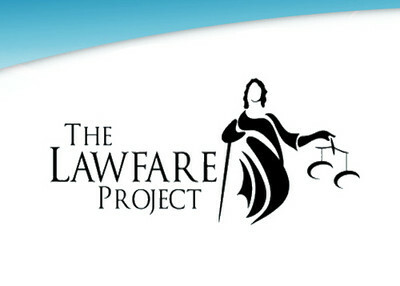 Setting the stage, the participants identified the scope of lawfare, providing some context for the issue. In 400 B.C. Chinese General Sun Tzu wrote in The Art of War, that in fighting a stronger foe, "success begins by seizing something which your opponents hold dear; then he will be amenable to your will." As the panel discussions demonstrated, America and the West hold dear the rule of law, and so our enemies have met with some success in attempting to hijack Western legal and moral principles to turn international media and public opinion against us. "Folks, that's got to be the next horizon for our community. In order to deal with these haters, these bashers, these Islamophobes, we've got to be willing to spend our money in a court of law. And not necessarily because we don't look for money, but we need to be able to say we need to spend our money and make you spend your money, and you're gonna stop doing this to us." In 2005, the Islamic Society of Boston filed a lawsuit charging defamation against over a dozen defendants, including the Boston Herald, Fox 25 News, and Investigative Project on Terrorism Executive Director Steven Emerson. The defendants were targeted by ISB for publicly speaking about the Islamic Society's connections to radical Islam and for raising questions about the construction of its Saudi-funded mosque in Boston. Two years after instituting the lawsuit, and immediately following the discovery phase of the litigation, ISB dropped its case. Similarly, in 2007, KinderUSA, sued terrorism analyst Matthew Levitt, claiming it was libeled in Levitt's book, Hamas: Politics, Charity and Terrorism in the Service of Jihad. In the book, Levitt included KinderUSA among "other American-based charities [which] continue to fund Hamas" after the Holy Land Foundation closed its doors. KinderUSA dropped the case four months later after Levitt and publisher Yale University Press filed motions invoking California's anti-SLAPP provisions—claiming the litigation was intended more to squelch the book than to produce any courtroom damages. "For example, one tenet of Shari'a law is to punish those who criticize Islam and to silence speech considered blasphemous of its prophet Mohammad. While the violent arm of the Islamist movement attempts to silence speech by murdering film directors such as Theo Van Gogh and by forcing thinkers such as Wafa Sultan into hiding out of fear for her life, the lawful arm is skillfully maneuvering within Western court systems, hiring lawyers and suing to silence its critics." These lawsuits are being used as a weapon of war against counter-terrorism experts, law enforcement personnel, politicians and anyone working to disseminate information on Islamist terrorism and its sources of financing. These lawsuits are often predatory, filed without a serious expectation of winning, and undertaken as a means to intimidate, demoralize and bankrupt defendants. Rather than simply identifying a problem without proposing solutions, panelists had many ideas for combating lawfare. First, in the face of frivolous suits intended to stymie debate, those who truly believe in the application of the rule of law to achieve justice must stand up and defend themselves against the allegations. As Utah Attorney General Mark L. Shurtleff explained during the conference, "the best defense to the legal manipulations of our adversaries is to take the offense and stand firm, as the Roman historian Livy wrote, with 'pride in our own past and our achievements.'" As Shurtleff stated, the battle will truly be lost if we cede the ground. More than simply playing defense, panelists agreed that reverence to the rule of law demands proactive action—filing civil suits against the supporters of terrorist groups to ensure that they are as bankrupt as the ideologies that they support. The war on terrorism today is virtually without borders and must be fought accordingly. While the United States has devoted tremendous federal resources to shutting down the support structure of terrorist groups, private citizens have already recognized that more can still be done. They have taken up arms against the support structure of terrorist groups, using the Anti-Terrorism Act of 1990 to hit these white-collar terrorists where it hurts the most—their checkbooks. In May 2005, the parents of David Boim, a 17 year old New Yorker who was killed in a Hamas terrorist attack in the West Bank, filed a lawsuit against U.S.-based organizations and individuals that provided logistical and financial support to Hamas. In December 2008, a federal appeals court ruling upheld the $156 million judgment against three of the charities. Similarly, in 2005 victims of Hamas suicide bombings sued National Westminster, a British-based bank, seeking to recover money from Hamas linked accounts. As current Israeli Ambassador to the United Nations Gabriela Shalev explained during the conference, "those engaging in lawfare are misusing the laws of war and the open-mindedness of democracies" to undermine the rule of law and diminish legitimate grievances. Rather than sit idly by and allow this to happen, the conference participants proposed a call for action—fight back. Since repeated requests from myself to the Wall Street Journal as to what constitutes a "frivolous or politically motivated lawsuit against US soldiers or policymakers"( as in the WSJ's repeated denunciations of "lawfare" in particular and the International Criminal Court in general), it is worth noting that the only "politically motivated" attempts to prosecute US leaders to date have been the attempted impeachments of Presidents Andrew Johnson in 1868 and Bill Clinton in 1998 and NEITHER had anything to do with the matter of war crimes or crimes against humanity! There are many human rights violations across the globe. Why won't some in the legal profession establish groups (call them any way you want) and swamp the international courts with lawsuits, actions, whatever regarding such violations? Make more countries the target of the International Criminal Court, and thus alleviate the pressure from Israel and the USA. And, if enough lawsuits are brought about, swamp the International Courts to the extent that they will find it harder to function. Thank you for another excellent essay. It is long past time for us to fight back but better late than never. It is high time we in the United States and other western countries started targeting the groups that support terrorist groups and terrorism. There are many Islamic groups that are extremely subversive and promote violence behind the scene as to not attract the attention of the gov't, which might be fatal. In this time of having an Islamist as POTUS, dear leader, the mullah obamaham it is of paramount importance that whatever and wherever we can combat legal jihad, stealth jihad, soft and hard jihad, we must step up to the plate today. For tomorrow it may well be too late. The Obama administration's support of so many Islam ic organization in our country is troubling and leave much to be desired in this commenter's opinion.